On installation jobs, time is money. 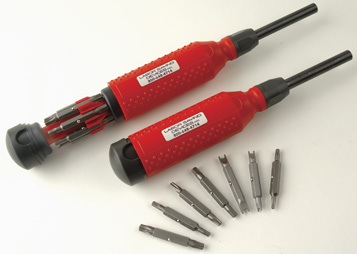 Many installers waste valuable time hunting for needed tools. Our MegaPro 15-in-1 Screwdriver has limitless uses and can replace numerous fixed head screwdrivers in your tool box, saving space, weight and time spent trying to find that “other” screwdriver. 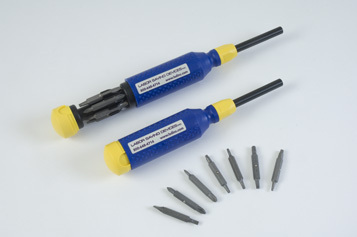 The MegaPro screwdrivers are made of high impact plastic and superior grade steel with industrial grade steel bits, available in either standard bit model or specialized bit model. Each model has in-handle storage for the collection of included quick change bits. The unique design also includes a rotating “palm” end cap to facilitate higher driving force and increased rotational torque when driving fasteners, a textured non-slip main body for improved grip, and a bit locking mechanism for secure and reliable fastener driving.